Your HVAC unit is the respiratory system of your home. With the air in a typical six-room home accumulating an average of 40 pounds of dust a year, you can bet there is more dust hiding in your ducts than shows up on your coffee table. When considering a duct cleaning two factors seem to be at the top of most lists, air quality and energy savings. Through normal occupation in a home, we generate a great deal of contaminants and air pollutants, such as dander, dust, and chemicals. These contaminants are pulled into the HVAC system and re-circulated 5 to 7 times per day, on average and causes a build-up of contaminants in the duct work. While dirty ducts don’t necessarily mean unhealthy air in your home, they may be contributing to larger health issues or harboring contaminants that could cause serious problems for people with respiratory health conditions, autoimmune disorders or some environmental allergies. 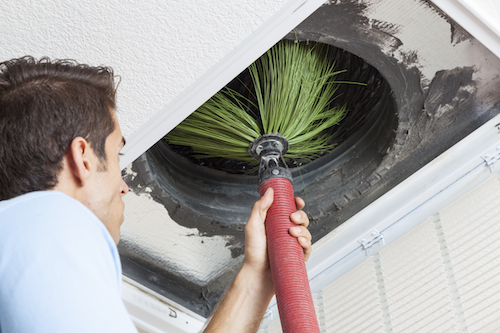 Have one of our professionals come to your home or office to give you an estimate on duct cleaning.